Dreaming about the end of the world, philosophy or destiny? The theme of world’s end or “apocalypse” is characteristic of many world cultures, religions and beliefs. Some of these beliefs include a notion that after this event, a renewal and reorganization of world structure comes about with superiority of a certain group of individuals ruling the new world. Other views include possible reincarnation of lives for those chosen members of society which are granted eternal heavenly existence on the face of the earth. The most pessimistic religions and worldviews treat the phenomenon of apocalypse as a final frontier to destruction and overarching presence of chaos and disorder. At times, we think of dreams which include the vision of apocalypse as a menacing warning projected onto ourselves. We are inundated with a strange warning messages and even start believing that something that had occurred in our dream is a precursor of events and consequences that will follow in our world of awakeness. The symbols of apocalypse in a dream include different kinds of images depending on individual’s perception of the world, but the general message behind this symbol is universal, it is a feeling of fastly approaching doomsday and the end of the world as the final countdown. The dreams can be interpreted using a multitude of approaches, depending on individual beliefs, religion and cultural perceptions as well as the extent of one’s philosophical grounds. Inability to control life events can usually lead to dreaming about apocalypse. 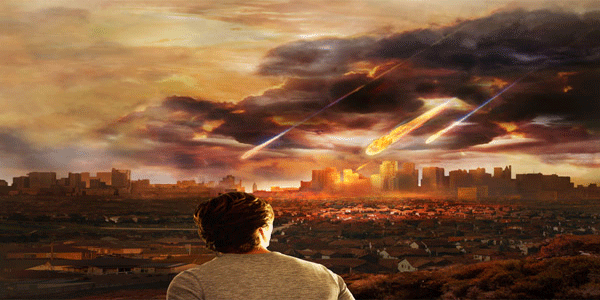 Other important factors playing a significant role in dreaming about apocalypse include puberty-related hormone activity, a sudden death of a loved one or close relatives (especially parents), divorce and some other significant life events and tragedies. Dreaming about the end of the world is a way for our subconsciousness to protect our well-being by offering an alternative to desolation and issues we fear in our everyday life. These dream usually contain a vision of the dreamer being alone and surrounded by strangers, which is a direct projection of people who had left him or her due to unanticipated or tragic circumstances which occurred in reality. From the culturology point of view, these visions of apocalypse are stemming from the fear and anticipation of the world’s end because of the seemingly fragile state of the world we live in and obvious vulnerabilities of humankind, the fear of something that is about to take place. These dreams are usually abundant when ubiquitous hopelessness and unpredictability come into play. Some sources indicate that these dreams occur at a turn of a century, when people are uncertain about things coming their way. Many dream interpretation sources make reference to disastrous events in the recent years, such as global warming, poor environmental conditions or even unexpected meteorite collisions with our planet. Other dream interpretation portal can blame unstable economic conditions or hardships for apocalypse dreams to be present. Overall, the apocalypse dreams are an indication of inability to cope with threatening reality and lack of means to counteract the unknown. When trying to find a perfect answer to your dream about apocalypse, try asking yourself in reference to your dream: what were the causes of apocalypse and who might have caused it? The dream can represent a call to protect yourself from a threat exerted upon you, trying to be more proactive in solving your own issues or a reason to reassess the rational causes of your fears. Symbols based on religion or culture represent very powerful visions related to dreams about the end of the world. Most commonly, the dreamer is exposed to visions related to religious values or philosophical views which may initiate such destruction or play a role in counteracting these visions accompanying the dream. Another way to explain these dream recollections is to take into account the mindset of people inclined to believe in mysticism, when they collectively face and counteract any sign of threat leading to destruction. These kinds of dreams are symbols of imminent restructuring of the way existing world functions. As a result, the dreams will appear in someone’s subconsciousness when they think that the entire world is acting against their way of thinking and by using the powers of something manifesting greater superiority can help them deal with an onslaught of secular issues they face. To put it to a less philosophical perspective, dreams about apocalypse can be an omen of just that - the end of human existence as we know it.